You know how much I love this blue lobster boat. 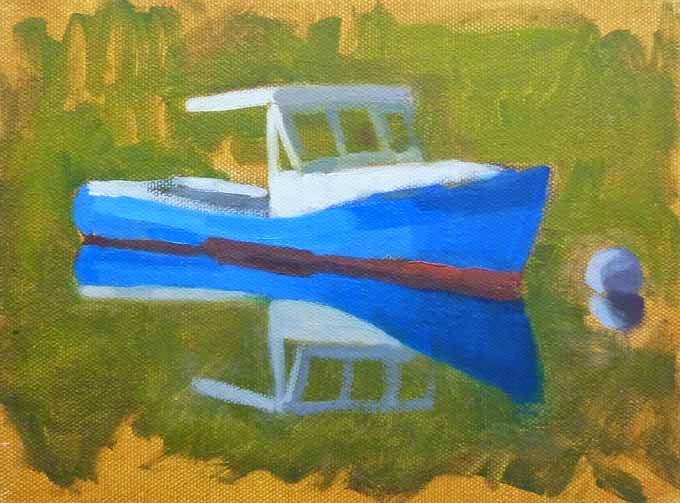 It's not in the water yet, so I pulled out a study I started some time ago, and just added the reflection of the cabin and fixed up the mooring ball. I decided to leave the background as it was. It is, after all, a study. I'm taking this painting and four others to Yarmouth Frame and Gallery tomorrow, for their next show, "Winter Cowers as Spring Empowers". The opening reception will be from 4-7PM on Saturday, May 9th. I'd love to see you there!